First Responders risk their lives every day…. RHYNO tools help make the job faster, safer, and easier. Click here to watch a demo of the NEW RHYNO 14.4V Compact Recip Saw. This lightweight, compact reciprocating saw was designed to make cutting in tight spaces easier than with traditional saws. With up to 3,400 strokes per minute, this saw achieves remarkable speed and efficiency. It also is powered by the same 14.4V – 2.0Ah batteries and charger from our RHYNO2 Windshield Cutter! Want to test it out yourself? Visit us at FDIC April 24-29 in Indianapolis, IN. We will also have our full line of RHYNO glass cutters and tools available for demos. Stop by our booth #6055 (Main Convention Center). 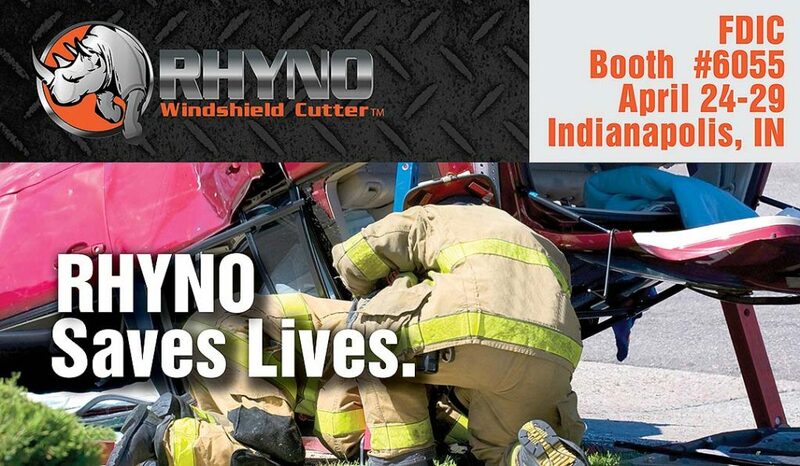 Kim Novak knows, RYHNO Windshield Cutters® save lives. She has seen first-hand how important speed and safety are for 1st Responders. Rescued from her burning car by Spokane Police Officer Tim Schwering -- using only a baton to smash her window -- Novak knows she is very lucky. Click here to watch a video of the heroic rescue. 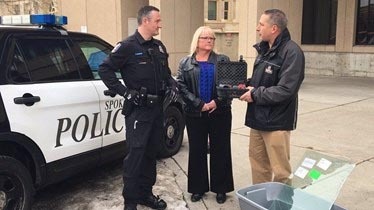 To thank Officer Schwering for his bravery, Novak donated a RYHNO Windshield Cutter® to the Spokane Police Department. The tool will aid in future rescues. Kim's rescue and tool donation are timely. Starting Sept. 1, 2017, new vehicles must meet ejection-mitigation standards set by the National Highway of Transportation Safety Administration. All 2018 cars will be equipped with safety glass, such as laminated glass, on all side windows next to the first three rows of seats and to a portion of a cargo area behind the first and second rows. Implemented to prevent full or partial ejection of passengers, this critical change will require an advanced glass-management tool to safely access crash victims with speed and dexterity.